As a healthy eating strategy, many experts recommend shopping the outer edges of the grocery store--the portions of the store containing real ingredients rather than processed, packaged foods. As an addendum to that advice, I'd also add spending about half that time in the produce section. This time of year, it's easy to do. After a winter and early spring of produce that has been shipped long distances from countries with different growing seasons, by summer, the produce aisle looks a lot more local. You can even bypass the grocery store and find a good farmers market for fresh, seasonal produce. Berries are one of those summer produce items that taste so much better when they haven't been frozen or even refrigerated for a long-distance trip. And strawberries are among the first berries to arrive in the summer. This salad hits all the flavor centers, with its sweet berries and honey, smoky-meaty bacon, slightly bitter spinach and feta cheese to lend sourness. I sprang for authentic Greek feta cheese for this salad, which I didn't regret, as it had a more interesting flavor than the usual domestic varieties I get. 1. Quick-pickle the onions: Combine onion, red wine vinegar, honey and salt in a bowl. Stir to coat onions. Set out at room temperature for 1 hour. Drain and rinse onions under cold water. 2. Toast walnuts in a small frying pan over medium-low heat until fragrant, about 8 minutes. 3. Place spinach in a large bowl. Whisk together the oil and vinegar and toss with the spinach. Add the quick-pickled onion and toasted walnuts. 4. Brown bacon in a medium frying pan over medium heat. Transfer to a paper-towel-lined plate. Then add to the salad. Toss to combine. 5. 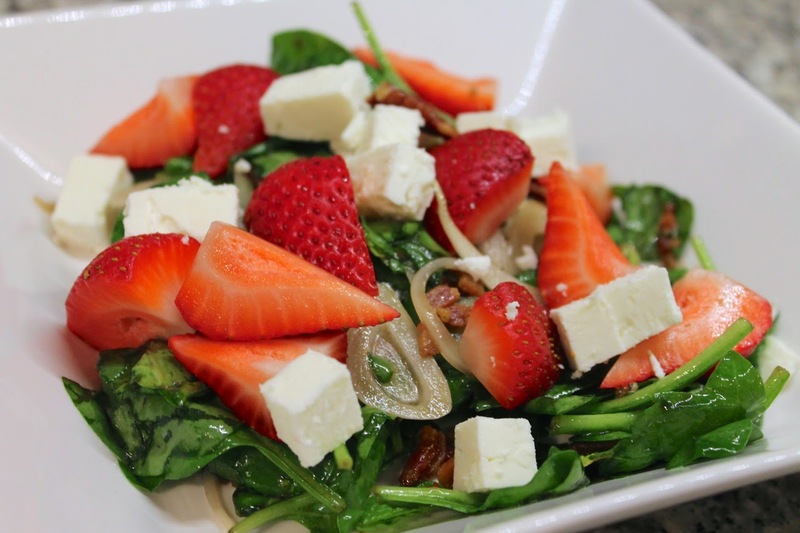 Serve salad in shallow bowls with fresh strawberries and crumbled feta.